A few weeks ago when the announcement was made of salesforce.com’s acquisition of Radian6, the trend of the consumerization of enterprise IT in general, and salesforce in particular, came up. Another aspect of this discussion is a reflection upon the increasing complexity that salesforce users face – as salesforce has extensively broadened it’s core offering, and introduced a number of parallel offerings, it seems contrary to this “consumerization” theme to increase the complexity for users. Luckily there are an entire wave of vendors, both service providers and product companies, looking for ways of making salesforce more productive for business users. I spent some time last week with one of these companies, ActiveEndpoints. Active Endpoints, is a vendor that provides a platform to develop, integrate and deploy business process applications quickly and easily. Their latest offering is Cloud Extend for salesforce, an offering that aims to deliver quick and simple salesforce customization. It’s a consumer approach towards customization, think of it like customizing a MySpace page (although perhaps that’s not such a good analogy considering MySpace’s plummeting fortunes) – no technical skills required. I spent some time getting a deep dive into Cloud Extend with John Cingari, CMO and Luc Clément, VP, technical services for Active Endpoints. The idea behind this product is pretty simple – Cloud Extend provides for a variety of decision tree type guides which are integrated with different parts of the salesforce application. These guides can either be specifically created by a subject matter expert within the end organization, or created by third parties. In fact Active Endpoints sees the potential of creating a marketplace for the selling of generalized guides for different verticals and processes. Once in place, the guides run sales and customer service agents through a process of questioning, the answers to which guide the conversation, but also feed back into specific fields within salesforce. Create the screens that contain the questions and possible answers (“guide”) for the callscript. Based on the answers to specific questions, they create additional screens andrelated text to enhance the guide. Insert pre-defined automated services as needed, such as adding a task to the lead record to demo the new product the following week. 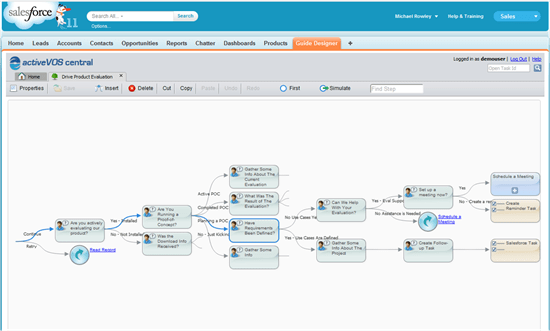 Cloud Extend for Salesforce.com adds this sales call to the lead activity history and can create a Salesforce Chatter message automatically. 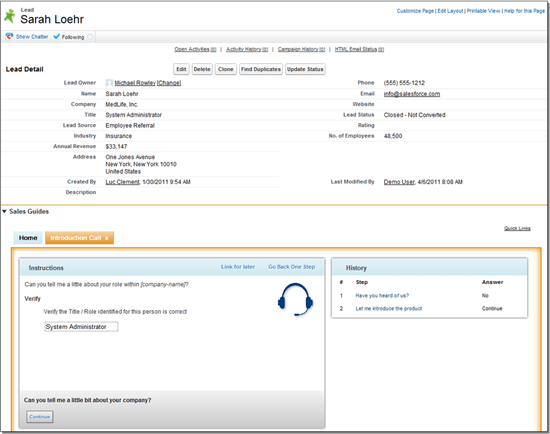 Publish the call script for use by sales representatives when making calls to prospects.They can view the call script embedded within the Salesforce UI itself. They never leavethe lead record. The script is viewed in context of the specific task. By delivering intuitive, user-driven customization and control to the Salesforce one-size-fits-all model, we believe that Cloud Extend will drive more sales of Salesforce, more use of Salesforce, and more reliance on Salesforce. I like the idea of contextual guides within the core salesforce application but, having just finished reading Guy Kawasaki’s book Enchantment, along with Gary Vaynerchuk’s tome The Thank You Economy, I do wonder about the negative effects of this formulaic approach towards customer service. In a world full of disenfranchised cubicle workers engaging in rote exchanges, I worry about a tool that seems to automate those very formulas – of course Active Endpoints is just addressing a latent need in the marketplace, but nonetheless it concerns me that need exists – far better that we empower employees to use initiative and surprise and delight tactics. In any case, Cloud Extend seems a nicely executed offering, and one that is sure to gain some uptake from organizations wishing to ensure consistency in approach.